The airline's marketeers lashed out at its rival last night. Even @AerLingus is talking about @Ryanair Business Plus. FYI, he's smiling cos he saved a fortune & avoided another late @AerLingus arrival! Poor Aer Lingus. 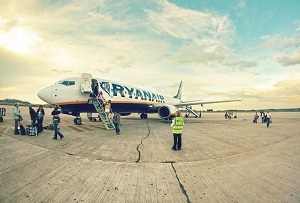 The spat took place against the backdrop of speculation about the future of the airline, which is actually 30% owned by Ryanair at the moment. British Aiways owner AIG is thought to be planning another run after a failed takeover last month. This would probably be welcomed by Ryanair, which may be forced to cut its stake in the business by a court ruling which is expected imminently. Talk of a takeover would likely help it do so at a more reasonable price. It looks like Michael O'Leary has given up on his long-cherished dream of taking over Aer Lingus, and the spurned suitor hasn't lost its sharp tongue.